To view the video of a traffic violation, please enter the Ticket Number, License Plate, and MVID Number (Alberta Vehicle Registration). If your vehicle is not registered in Alberta, you can request a password to view the video. If you experience any difficulty viewing the video of the violation, please refer to our Troubleshooting Guide. 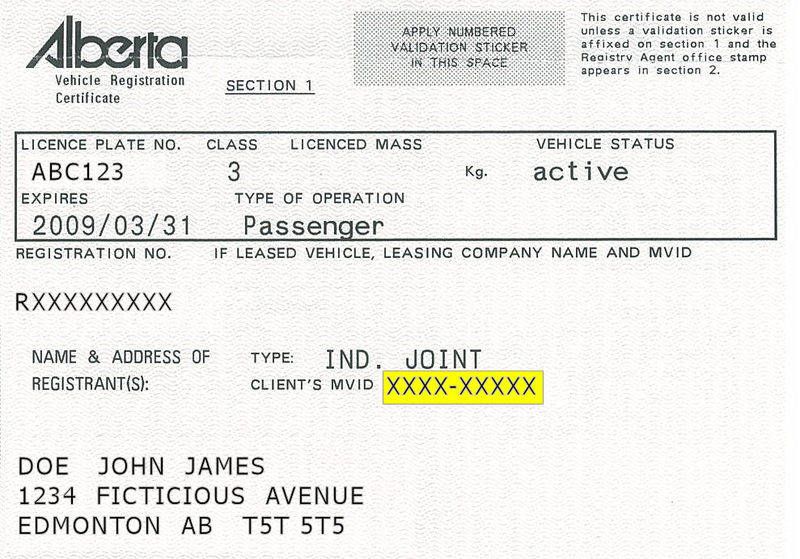 The MVID Number is a unique ID found on your vehicle registration as Client's MVID. Please provide an email to which a password can be sent. If you do not receive within 30 minutes of your request, please verify that it is not going to your junk mail, and if further assistance is necessary call 1-877-998-4327 Monday to Friday between 8am and 4pm MST. Although we strive to make the videos accessible to as many as possible, the video unfortunately may not be able to play on certain devices and browsers. Updated versions of Google Chrome, Microsoft Edge, and Firefox are all supported on Windows platform, as well as Safari and Google Chrome on Macs. Videos have been confirmed to play on most iOS and Android devices with the latest software updates, but at this time remain unsupported. ** If you are unable to load the video using an unsupported browser or platform, please try one of the supported browsers and plaforms listed above. Tip 1 - Play video 2nd time (1st time caches video). Tip 2 - Download video (either compressed or original) and play directly from your computer once it has finished downloading. Tip 3 - Ensure that your internet service has not been interrupted and is performing adequately. Tip 4 - Some devices may not have the necessary computing power to play the video without lag, and you may need to find a more capable machine. If you are still experiencing issues loading or playing the videos, please submit a request for Technical Assistance.